BHAKTAPUR, Aug 27: The Gaijatra festival has started in Bhaktapur as in other places with predominantly Newar settlements across the country today. 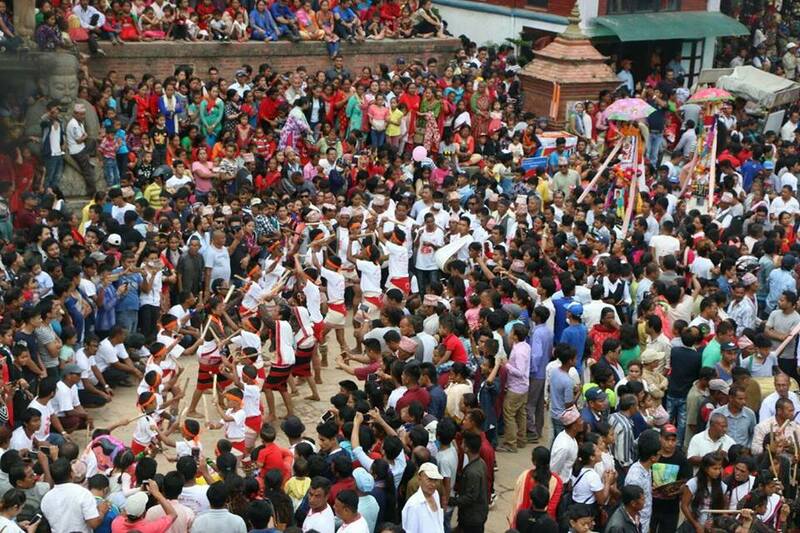 But the Gaijatra festival in Bhaktapur is unique in that it is celebrated for a week. This cultural festival starts in Bhaktapur with the preparation of tahhamacha and taking it around the locality from the Talejusthan. The festival is observed in commemoration of all the deceased members of the family of a locality wishing for peace to the departed soul. The family where the death of a member has occurred in the past year takes out a procession comprising a decorated cow or the animal's replica, boys wearing clownish clothes and gesturing comical scenes. The procession is paraded around different places of the town. Another unique feature of the Gaijatra festival in Bhaktapur is the performance of the ghintang kisi traditional dance. The ghintang kisi dance come out in troupes at the same time. It is a kind of stick dance where the dancers holding truncheons strike these truncheons with each other in a patterned way producing rhythmic clanking sound. According to culture expert Ram Shekhar Shrestha, the Padma Purana, a Hindu religious text, states that the main gate to the Yamaloka or the world of Yamaraja, the god of death, remains closed for most of the year and is opened only after the organisation of the Gaijatra festival on Mrityuloka (Earth) and the departed souls get entry to Yamaloka where they are redeemed. Decorated cows are taken in procession around different places on the occasion of the Gaijatra in the belief that the journey of the departed souls from the Earth to the Yamaloka would be easy as they can cross the mythological river Baitarini holding on the cow's tail. The local cultural experts and historians believe that the festival originated during the Lichhavi period (the early medieval historical period) in the 14th century as per the Bikram Sambat calendar. On the day of Gaijatra, a straw figure of the Bhairab deity accompanied by the tahamacha, is taken around the town early in the morning before the crawing of the rooster, as per the tradition. There is also tradition that one has to wear nine sets of clothes, eat nine varieties of food and make a round of the town nine times on this day.